Whole New Category to Choose From! 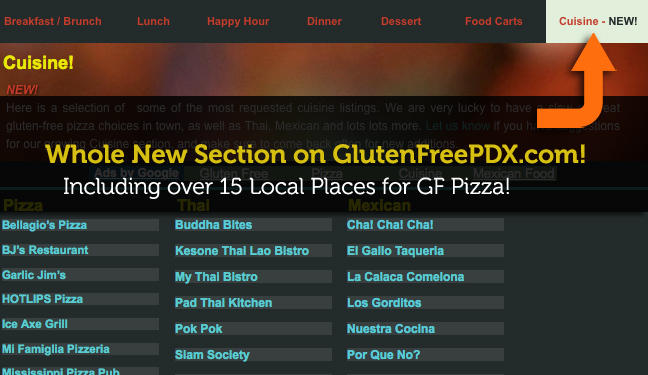 Constantly trying to improve GlutenFreePDX to make it as useful and innovative as possible. It has been a challenge to keep up with all of the dining spots in Portland, as many of them change their menus, close up shop or get added to the scene in rapid-fire successsion. After some planning, we have launched a page dedicated to Cuisine, starting with Pizza and Thai, and expanding rapidly into different categories. Did you know there are over 15 places in our community that offer gluten-free pizza dough? Not only that, but now it’s super simple to follow your tastebuds to just the right place for lunch or dinner. Did you know there are over 15 places in our community that offer gluten-free pizza dough? We hope you like the new page, it’s going to be rapidly expanding over the next few months, thanks for visiting! This entry was posted in Beer, restaurants, Website and tagged Cuisine, GF, gluten free cuisine, gluten free pizza, Gluten free Portland, gluten free portland pizza, PDX gluten free, Portland Gluten Free on October 12, 2011 by glutenfreepdx.